Kaypro, dawn of my computer age, fire of primal lust for processing words. Kay-pro. Hi-ho. It's off to work we go. In today's New York Times Magazine Virginia Heffernan (aka Vladimir) lauds the return of the basic computer screen (black screen, green letters) made possible by the creators of WriteRoom, a software alternative to Microsoft Word. It's for "people who enjoy the simplicity of a typewriter, but live in the digital world." (hello, MFO) Swoons Heffernan: For those of us who learned Basic on a Zenith Z19 and started word processing on a Kaypro (anyone? ), the retro green-and-black now takes the breath away. 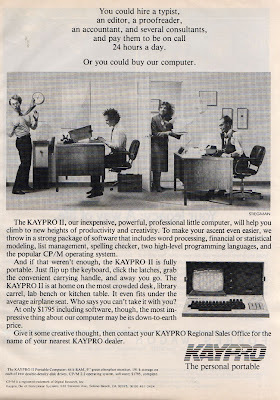 Or, perhaps it was the print ad that ran before Kaypro makers acquired an agency. According to a guy who claims to be in the know, before Kaypros were actually introduced, the president of the company (geekily named Non-linear Systems) promoted his son to head of marketing. 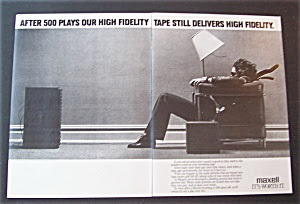 The son loved the Maxell ads that were popular then, and thought it would be a good idea to imitate them. Non-linear Systems was in California and Junior hopped a plane to New York and tracked down the photographer who did the shot: Steve Steigman. Steigman naturally asked to see the layout, but was told there was no layout. No comp. There wasn't even an agency. Presumably not wanting to lose the fee, he and the marketing guy sat down and sketched out a lame imitation of what AD Lars Anderson (Scali, McCabe, Sloves) did for Maxell: an office situation in which the Kaypro appears to be levitating and blowing air out to passing coworkers, which came to be known to insiders as "the flying fart ad". 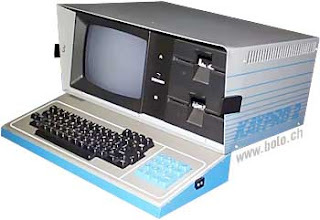 What made the Kaypro so appealing to my husband and others besides the all-inclusive price, was its big (9 inch!) screen and the fact that it was light enough to be called "transportable". At 28 pounds, it was a lot easier to schlep around than its competition, the Osborne which was marketed as the world's first "luggable" computer. Because the Kaypro came in an aluminum carrying case complete with heavy-duty plastic handle, I was able to tote it to my job as copywriter at A Hot Agency where I wrote body copy in Wordstar and printed it out on a daisy wheel printer. Coworkers marveled that I dared entrust my creativity to a machine. The only other computers in the agency then sat on secretaries' desks: Wangs the size of the Lochness monster. If you missed the Age of Kaypro, it's not too late to get in. There's one listed on Ebay today, starting bid $24.99. This is fascinating on a bunch of levels. I have fond memories of my first computer, an IBM dual floppy machine that ran WordStar. Not sure if I'm romanticizing it, but it seems it was a much better, much simpler program than Word, and that it didn't automatically start formatting whatever I was writing into a list when I typed "1." I have not downloaded the program you and Heffernan mentioned yet, but I did go to the site and was thrilled to see it ran on Mac. Your post is also interesting to me because I think the changes going on in the mid-80s, when computers were first being introduced to America, were pretty earth shattering, and that only years later will we realize what a revolution was going on. Thanks for the comment, Toad. I think you're right about the 80s. To further illustrate your point--about the same time, I received an assignment my AD and I thought was ridiculous: come up with an ad for the first home fax machine. Who'd want a fax machine in their home, we thought. The ad was weeks late b/c the strategy kept changing, as no one at the agency thought the product could sell. I'm with you on Word. I think the other alternative to it Heffernan mentioned, Scrivener, might be even tastier, though not as satisfyingly minimalist as WriteRoom. Both are for Mac. 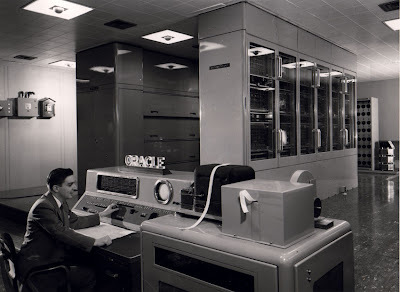 I remember the first computer that my Dad bought for my journalist Mom...no hard drive, you had to "trick" it into saving anything and even though it could keep maybe 6 KB of information on it. And it was awesomely powerful. I really like the old Kaypro ad though. Quintessentially 80s advertising on every level, it makes me think how much like schooling fish we in the industry are - decade by decade our ads look awfully similar.